As an effective executive whose company runs smoothly, you strive to have satisfied employees and a good business reputation. But all of that gets disrupted when someone gets injured at your workplace. The incident affects more than just the victim — it tarnishes team morale and places a stigma on your brand. Employees and outsiders whisper of your business, “They should have seen it coming.” And they may be right. 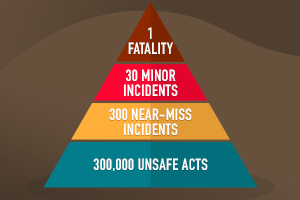 Injuries can be foreshadowed through a model called the safety pyramid that works as follows: for every severe injury, like a death or dismemberment, there are 10 major incidents, 30 minor incidents, 300 near-miss incidents and 300,000 unsafe acts that happen before. Rack up high numbers in the lower pyramid and this predictive ratio won’t bode well for the fate of your employees. It’s not too late to minimize risk before top-of-pyramid catastrophes strike. We can walk you through common approaches to managing risk and provide tools designed to lessen incidents throughout the safety pyramid. Are employees to blame for a workplace accident? That’s what the theory of behavior-based safety contends. The idea behind BBS is that most injuries are the result of employee behavior, so managers wishing to minimize risk should create programs to incentivize safe action. These programs can prioritize safety as part of employee performance reviews and bonus pay, and some BBS programs reward employees who report a colleague’s risky behavior. BBS has a proven record of results, and for good reason. Cautious people are less likely to incur a major injury. But the approach is not without flaws. BBS can discourage workers from disclosing minor injuries or near-misses because they fear being blamed. It also is potentially less effective in industries with high turnover because employees still learning safety protocols can’t participate fully in a system of reporting incidents and infractions. What if the best way to minimize injury risk is to save workers from themselves? In an engineered solutions approach, facilities and workflows are constantly reconfigured to keep workers out of harm’s way. The merit of an engineered approach is clear: in a space designed to minimize risk, employees have to do something extraordinary to put themselves in danger. But it’s impossible to control human behavior, and some workers will still find themselves in bad situations. So what’s better: a risk-management system based on human behavior or a system based on structures and workflows? We find value in both approaches. That’s why BasicSafe software measures and monitors the best aspects of each model. Contact us today and tell us about your safety management needs. We’ll explain how we can help you monitor both behavior and workspace. You’ll be the leader who keeps safety pyramid numbers low, rather than the careless boss who should have seen disaster coming. BasicSafe’s tools can help you promote a safety culture within your company, and reduce lost time, injury rates and unsafe acts.